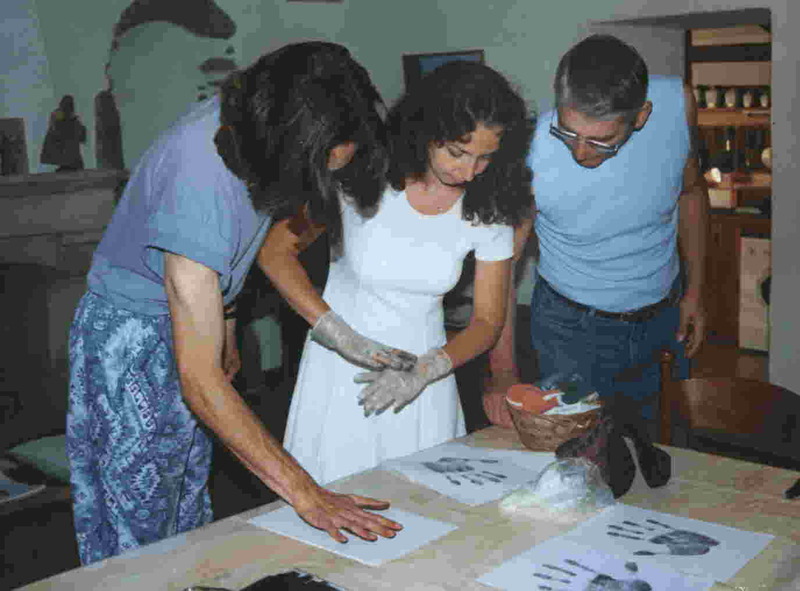 Would you like to try a free practice test after learning a few things about hand prints? When I mention that I read hands, I often end up with an open hand in front of my nose. However, I find it much easier to see the lines and signs when they are in black and white (ink on paper), than when they are darker pink on lighter pink. Also, the shape of the mounts and fingers, the spacing of the fingers and the texture - all very meaningful in an analysis - can only be seen on a print. Of course, fingernails, color, temperature and flexibility can't be seen on a handprint, even though they can tell a lot from a person. But to me, the prints themselves are very important, especially because you can get to know a person without ever communicating with him or her! For this free practice test, I propose to explain the meaning of a few features (fingertips, thumb angle and bottom phalanges) that can only be seen on prints. Each one is explained below the illustration. Read the information, then try the Free Practice Test by clicking on the link at the bottom of this page. The first feature is the fingertips, in particular their shape, which can be conic, spatulate or square. Conic (Fig. 1) You usually express yourself in an artistic, aesthetic or idealistic way. You like order and try to find perfection. You are refined but can be picky. You enjoy making things beautiful around you. You make sure that you are not hurting anybody in your speech. However you can also be disappointed in others, so try to understand that they may not have your artistic sense. Spatulate (Fig. 2) You usually express yourself in an inventive way. You are expressing your personality with an attitude of sharing and expansion. You are spontaneous, enthusiastic and broad-minded. You are probably dexterous but may sometimes be a bit uncoordinated. Square (Fig. 3) You usually express yourself in a practical way. To feel comfortable, you need concrete structures. You are generally self-disciplined, down to earth, and reliable. You are productive and could succeed in business. Since you can be cut and dry, remember to add smoothness to your approach. Next, we will analyze the thumb angle. Is it equal to 45°, or less, or more? The thumb angle is equal to 45° (fig. 4): You are open and spontaneous in the way you are expressing yourself. The thumb angle is less than 45° (fig. 5): You fear the unknown or the unfamiliar and you feel preoccupied with your inability to cope with challenging situations. By accomplishing modest tasks, you can learn to become more confident and you will be better prepared to undertake life's challenges. The thumb angle is more than 45° (fig. 6): You are very expressive and spontaneous. Your excessive enthusiasm may overwhelm and alienate others. You must exercise self-restraint in your relationships and also guard against taxing your own energy. Finally, we will consider the shape of the bottom phalanges, i.e. whether they are wide, barely visible, or balanced. The bottom phalanges are very wide (fig. 7). For you, the body and the senses are very important. You probably enjoy good food and comfort and are very aware of sensual pleasures. You likely have a good sense of touch. The bottom phalanges are barely visible on the print (fig. 8). Your comfort is not a priority. You have other things to worry about! (like social or mental priorities) If the phalanges are also short, you may have a general lack of energy or passion. The bottom phalanges are balanced (fig. 9). You understand that your body and comfort are important, but you give them as much priority as the social and mental areas of your life. Now try the Free Practice Test! 1. Which fingers have spatulate, square, or conic fingertips? 2. How would these shapes be reflected in the different areas of this person's life? 3. How is the angle of the thumb with the rest of the hand? What does it mean? 4. How wide are the bottom phalanges of the fingers on the whole hand? How important is the body to this person?